Often when we look in the mirror we are just checking to make sure that our hair is tidy or our make-up is correctly applied. Have you ever REALLY stopped and had a look at yourself? Have you smiled at yourself (and seen how your face changes when you smile)? Have you talked to yourself and told yourself how amazing you are? 1) Well, for this lesson you are going to be spending some time just looking at yourself in the mirror really - looking at yourself. 2) When you are finished write down 10 words to describe yourself - these must be positive words and they must go beyond your PHYSICAL features. 3) Based on the words you have written, you are to create an avatar of yourself that reflects your descriptive words.... it does not have to look like your physical appearance but the person you REALLY are inside. 4) You can use one of these three programs to make your avatar and then it must be embedded in your website on the MIRROR, MIRROR page with your ten descriptive words. 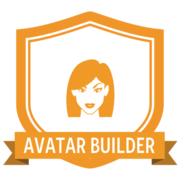 Once you have created your avatar and shown your teacher you will be given a CLAIM CODE to receive your badge.